The relationship between a customer and a financial employee is based on trust. If the employee does not want to damage that relationship, he should sufficiently take into consideration the wishes of his customer. Moreover, the Belgian customer is well protected by all kinds of legislation. It is not always easy to find a balance between the interest of the customer and the commercial goals of the financial institution. The trade unions, for example, are of the opinion that financial institutions should not only measure the performance of their employees on the basis of sales figures. When selling a product or service, a relationship of trust between customer and financial employee is central. Due to the fact that, in the past few years, the customer database within the financial institutions has clearly been segmented, the financial advisors have also specialised in a specific customer profile. The quality of the advice to the customer benefit from this. In Belgium and Europe, the investor is protected by various pieces of legislation. The moratorium on the commercialisation of especially complicated financial products is an example of this. The financial sector has voluntarily endorsed the moratorium , which obliges it not to commercialise any structured products that are defined as especially complicated by the Financial Services and Markets Authority (FSMA). The MiFID Directive also aims for better protection of the investor. MiFID provides that a financial advisor should not sell investment products to a customer if they do not match the customer’s investor profile. There is no discussion about the objective of MiFID. The question may arise, however, whether the manner in which the investor profile is drawn up does not leave too much room for interpretation. Each financial institution, after all, can prepare the questionnaire freely that determines in which profile a customer is categorised. All the surveyed institutions train their sales staff on their range of products. 72% of the sector (11 out of the 19 institutions surveyed) also train staff in the prevention of an excessive debt burden, and 37% (3 out of the 19 institutions surveyed) offer training sessions to assess the mental capacity of customers when they take a financial decision. 60% (6 out of the 19 institutions surveyed) of them provide training sessions about sustainable products, such as socially responsible investments or green loans. In the past, a number of financial institutions stimulated the sale of investment products with remuneration for the sellers. The financial crisis has forced the institutions to go back to basics and placed the focus on saving deposits again. However, there are still investment products backed by a sales strategy. 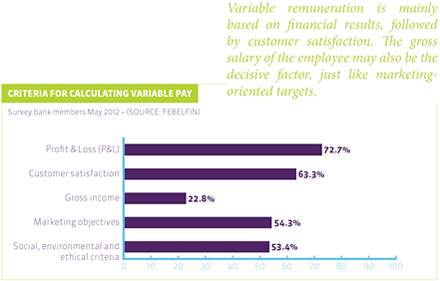 97% (17 out of the 19 institutions surveyed) pay their sales staff a variable remuneration. The proportion of this variable remuneration in relation to the total salary depends on the employee’s position. For someone working within the Retail department, in 87% of cases (6 out of the 17 institutions surveyed) the variable part of the salary will be less than 10% and in 4% (5 out of the 17 institutions surveyed) between 10 and 25%. When an employee of the Trading department receives a variable salary, in 22% of cases (5 out of the 17 institutions surveyed) this will be less than 25% of his total salary package. In 70% (5 out of the 17 institutions surveyed) of the cases the variable portion amounts to between 25 and 75% of the total package. One surveyed institution indicated that the variable salary could be as high as 150%. A variable salary is mainly defined by the P&L (profit and loss account) of the bank. This does not mean, however, that social aspects, such as customer satisfaction, cannot play a part. Within 53% of the sector (5 out of the 19 institutions surveyed) social, ethical and green values are also taken into account for the payment of a variable salary. The challenge for the future will be to ensure that the sales strategy within the financial institutions will no longer result in excesses.